Amazon.com description: Product Description: This step-by-step handbook guides beginning researchers through the stages of planning and implementing case studies. Starting with how to establish a rationale for conducting a systematic case study and identifying literature that informs the research effort, this indispensable resource shows students how to determine an appropriate research design and conduct informative interviews, observations and document analyses. It also describes how to derive meaning from data and how to communicate results. Finally, the authors delineate the ways to verify the results attained. Students and advisors can use these easy-to-follow steps to shape a thesis, dissertation, or independent project from conceptualization to completion. This book features: a step-by-step approach that speaks directly to the novice investigator; many concrete examples to illustrate key concepts; and questions, illustrations, and activities to reinforce what has been learned. 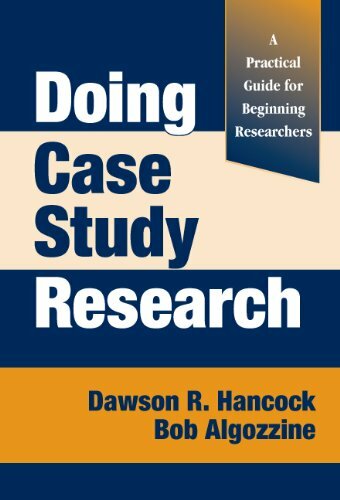 About: This step-by-step handbook guides beginning researchers through the stages of planning and implementing case studies. About: ''A highly accessible introductory text and a very quick read . About: This practical handbook guides beginning researchers through the stages of planning and implementing case studies.